In faith and the miracles of the divine, many find a greater purpose. Called to serve powers beyond most mortal understanding, all priests preach wonders and provide for the spiritual needs of their people. Clerics are more than mere priests, though; these emissaries of the divine work the will of their deities through strength of arms and the magic of their gods. Devoted to the tenets of the religions and philosophies that inspire them, these ecclesiastics quest to spread the knowledge and influence of their faith. Yet while they might share similar abilities, clerics prove as different from one another as the divinities they serve, with some offering healing and redemption, others judging law and truth, and still others spreading conflict and corruption. The ways of the cleric are varied, yet all who tread these paths walk with the mightiest of allies and bear the arms of the gods themselves. Alignment: A cleric’s alignment must be within one step of her deity’s, along either the law/chaos axis or the good/evil axis. The cleric’s class skills are Appraise (Int), Craft (Int), Diplomacy (Cha), Heal (Wis), Knowledge (arcana) (Int), Knowledge (history) (Int), Knowledge (nobility) (Int), Knowledge (planes) (Int), Knowledge (religion) (Int), Linguistics (Int), Profession (Wis), Sense Motive (Wis), and Spellcraft (Int). The following are class features of the cleric. Clerics are proficient with all simple weapons, light armor, medium armor, and shields (except tower shields). Clerics are also proficient with the favored weapon of their deities. A cleric of a chaotic, evil, good, or lawful deity has a particularly powerful aura corresponding to the deity’s alignment (see detect evil for details). You can proselytize for your deity, using your powers of persuasion and social influence to indoctrinate an NPC in the dogma of the faith while inspiring their fealty. Converting an NPC to your faith is similar to modifying their reaction with Diplomacy. You can only attempt to convert NPCs who are at least indifferent toward you, though you can take time to make a hostile or unfriendly NPC indifferent, and then begin the process of conversion. The DC of a conversion depends on how many conversion steps away from your faith an NPC is, starting at one conversion step for an NPC with no significant faith who matches your faith’s alignment. For each step the NPC’s alignment differs from the alignment of your faith, add one conversion step. If the NPC already holds a significant religious belief, add an additional conversion step. Note that servants of other faiths— including divine spellcasters who worship a deity and agents in the employ of a formal religion—normally can never be converted to a new faith. The GM has final discretion over whether an NPC will ever convert to your beliefs. If the GM rules that an NPC can be converted, the DC to convert that NPC is 10 + the NPC’s Hit Dice + the NPC’s Wisdom or Charisma modifier (whichever is higher) + 5 per conversion step. For example, a 5th level warrior with a Wisdom of 12 and no existing significant faith and who is the same alignment as your deity has a conversion DC of 21. Each conversion attempt requires at least an hour of proselytizing, and you can attempt no more than one conversion check per week. For your conversion attempt, roll a Diplomacy check and a Knowledge (religion) check at the DC determined above. If you succeed at both checks, decrease the number of conversion steps for that NPC by one. If you fail either check, you reinforce the NPC’s existing faith and add one to the number of conversion steps for that NPC. If you fail three checks over the course of a conversion effort, the NPC rejects your faith and you cannot attempt another conversion for a year. However, if the number of conversion steps ever reaches 0, you convince the NPC to adopt your religion. Note that this does not necessarily change the NPC’s alignment. While proselytizing is a reasonable activity for a religious adventurer, it should be handled with sensitivity, both in character and at the gaming table. Having a PC repeatedly attempt to convert NPCs who aren’t interested is likely to result in worsening their attitude toward the character, and significant effort may be required to restore those relationships. Some players may be uncomfortable with too much time being spent on religious talk, in which case a GM is free to simply treat the conversion as a skill check, without actually roleplaying the talks that allow the conversion check to take place. Characters that successfully convert others to their faith can gain divine blessings for adding new members to their religion. The first time at each character level a PC converts an NPC, they gain a conversion bonus for a number of days equal to the level of the NPC converted. Typical conversion bonuses for various faiths, and examples of classes likely to be interested in converting, are listed on the following page. In the case of Neutral deities, the bonus may be a sacred or profane bonus as most appropriate for the PC who gains it. A cleric casts divine spells which are drawn from the cleric spell list. Her alignment, however, may restrict her from casting certain spells opposed to her moral or ethical beliefs; see Chaotic, Evil, Good, and Lawful Spells. A cleric must choose and prepare her spells in advance. To prepare or cast a spell, a cleric must have a Wisdom score equal to at least 10 + the spell level. The Difficulty Class for a saving throw against a cleric’s spell is 10 + the spell level + the cleric’s Wisdom modifier. Like other spellcasters, a cleric can cast only a certain number of spells of each spell level per day. Her base daily spell allotment is given on Table: Cleric. In addition, she receives bonus spells per day if she has a high Wisdom score (see Table: Ability Modifiers and Bonus Spells). Clerics meditate or pray for their spells. Each cleric must choose a time at which she must spend 1 hour each day in quiet contemplation or supplication to regain her daily allotment of spells. Time spent resting has no effect on whether a cleric can prepare spells. A cleric may prepare and cast any spell on the cleric spell list, provided that she can cast spells of that level, but she must choose which spells to prepare during her daily meditation. Chaotic, Evil, Good, and Lawful Spells A cleric can’t cast spells of an alignment opposed to her own or her deity’s (if she has one). Spells associated with particular alignments are indicated by the chaotic, evil, good, and lawful descriptors in their spell descriptions. Clerics can prepare a number of orisons, or 0-level spells, each day, as noted on Table: Cleric under “Spells per day.” These spells are treated like any other spell, but they are not expended when cast and may be used again. No—unless an ability specifically says it stacks with similar abilities (such as an assassin’s sneak attack), or adds in some way based on the character’s total class levels (such as improved uncanny dodge), the abilities don’t stack and you have to use them separately. Therefore, cleric channeling doesn’t stack with paladin channeling, necromancer channeling, oracle of life channeling, and so on. Regardless of alignment, any cleric can release a wave of energy by channeling the power of her faith through her holy (or unholy) symbol. This energy can be used to cause or heal damage, depending on the type of energy channeled and the creatures targeted. A good cleric (or a neutral cleric who worships a good deity) channels positive energy and can choose to deal damage to undead creatures or to heal living creatures. An evil cleric (or a neutral cleric who worships an evil deity) channels negative energy and can choose to deal damage to living creatures or to heal undead creatures. A neutral cleric of a neutral deity (or one who is not devoted to a particular deity) must choose whether she channels positive or negative energy. Once this choice is made, it cannot be reversed. This decision also determines whether the cleric can cast spontaneous cure or inflict spells (see spontaneous casting). Channeling energy causes a burst that affects all creatures of one type (either undead or living) in a 30-foot radius centered on the cleric. The amount of damage dealt or healed is equal to 1d6 points of damage plus 1d6 points of damage for every two cleric levels beyond 1st (2d6 at 3rd, 3d6 at 5th, and so on). Creatures that take damage from channeled energy receive a Will save to halve the damage. The DC of this save is equal to 10 + 1/2 the cleric’s level + the cleric’s Charisma modifier. Creatures healed by channel energy cannot exceed their maximum hit point total—all excess healing is lost. A cleric may channel energy a number of times per day equal to 3 + her Charisma modifier. This is a standard action that does not provoke an attack of opportunity. A cleric can choose whether or not to include herself in this effect. A cleric must be able to present her holy symbol to use this ability. A cleric’s deity influences her alignment, what magic she can perform, her values, and how others see her. A cleric chooses two domains from among those belonging to her deity. A cleric can select an alignment domain (Chaos, Evil, Good, or Law) only if her alignment matches that domain. If a cleric is not devoted to a particular deity, she still selects two domains to represent her spiritual inclinations and abilities (subject to GM approval). The restriction on alignment domains still applies. Each domain grants a number of domain powers, dependent upon the level of the cleric, as well as a number of bonus spells. A cleric gains one domain spell slot for each level of cleric spell she can cast, from 1st on up. Each day, a cleric can prepare one of the spells from her two domains in that slot. If a domain spell is not on the cleric spell list, a cleric can prepare it only in her domain spell slot. Domain spells cannot be used to cast spells spontaneously. In addition, a cleric gains the listed powers from both of her domains, if she is of a high enough level. Unless otherwise noted, activating a domain power is a standard action. A good cleric (or a neutral cleric of a good deity) can channel stored spell energy into healing spells that she did not prepare ahead of time. The cleric can “lose” any prepared spell that is not an orison or domain spell in order to cast any cure spell of the same spell level or lower (a cure spell is any spell with “cure” in its name). An evil cleric (or a neutral cleric of an evil deity) can’t convert prepared spells to cure spells but can convert them to inflict spells (an inflict spell is one with “inflict” in its name). 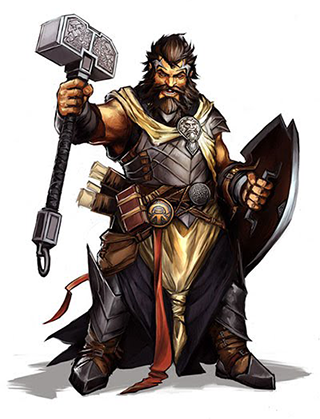 A cleric who is neither good nor evil and whose deity is neither good nor evil can convert spells to either cure spells or inflict spells (player’s choice). Once the player makes this choice, it cannot be reversed. This choice also determines whether the cleric channels positive or negative energy (see channel energy). A cleric’s bonus language options include Celestial, Abyssal, and Infernal (the languages of good, chaotic evil, and lawful evil outsiders, respectively). These choices are in addition to the bonus languages available to the character because of her race. A cleric who grossly violates the code of conduct required by her god loses all spells and class features, except for armor and shield proficiencies and proficiency with simple weapons. She cannot thereafter gain levels as a cleric of that god until she atones for her deeds (see the atonement spell description). Instead of receiving an additional skill rank or hit point whenever they gain a level in a favored class, some races have the option of choosing from a number of other bonuses, depending upon their favored classes. The following options are available to the listed race who have cleric as their favored class, and unless otherwise stated, the bonus applies each time you select the listed favored class reward. Racial Archetypes – The following class archetypes are available to members of the listed race. *Must be taken at level 1. Replaces one domain power from one of the cleric’s domains.